Lights, yes, Camera? Nah.. Well, I took the photos with a camera.. Technically? And Pirouette My Whistle.. Yeah. I honestly am the most loser-y person I know most days.. Moving on.. I picked Essie Lights the other day and was EXTREMELY excited about it.. It just looked so jazzed up and amazing in the bottle.. And I'm on a strange kick/fascination with all things neon lately.. It lived up to my expectations. 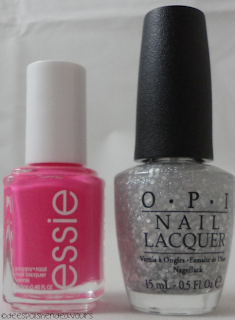 During that same shopping trip, I grabbed a couple of polish from the OPI Ballet collection.. Even though I wasn't too thrilled by the whole collection, seeing these two gems in person made me really, really want them! One of the pair that I nabbed is Piroutte My Whistle. I had been playing with some nail wheels.. And had PMW over Lights.. And immediately I took off what I was sporting and slapped these gems on. It was basically like having heaven on display on my nails for a few days. Yeah, these two together made me THAT happy. This was actually Essie Lights over Orly White Out (I prefer to put neons on over a base of white.. I feel it makes them look more awesome and opaque! ), then a coat of OPI Pirouette My Whistle. I seriously love this and almost want to just do this again. Actually, maybe it will be my next pedicure! That is all for today - see you all again real soon! that essie looks amazing! almost makes me want to break my no buy!! hahah! oh wait.. I already did that! i bought cheeky chops from tracefacephiles blog sale! for 10 bucks! woot woot. @PassionForPolish: Thank you - I completely agree! @Desiree: I am very terrible for being an enabler and also able to justify anything - but I think you should break your no buy again.. For this gem! I absolutely love this polish! ORRRR you could put it on your wishlist (: AND I'm stoked you bought Cheeky Chops - solid breakage of the no buy! !